Transportation in Malaga: Car hire, taxis, buses, trains and flights. Malaga City is a very central spot along the Costa del Sol and even within Andalusia, so that one can find optimal transport possibilities. Malaga Airport is the 4th largest in whole Spain referring to the passenger numbers and is situated just 10 km to the southwest of the city centre. There are both national and internation flights, operating with airports in whole Spain and Europe (particularly UK and Germany), North Africa, Middle East and North America via New York. There are other transportation services, specially used by tourists, such as car hire at Malaga airport and private transfers. Taxis in Malaga are white with a diagonal blue stripe. About 1,400 taxis circulate in the city and they can be taken at designated stopping points (for example outside the train station or in Alameda Principal), called by phone/Internet or stopped in the middle of the street. You can also find companies that provide private transfers in Malaga, these services are just like taxis, but the cars used are quite better and drivers are English-speakers. There are also Malaga airport transfers with minibuses available for those coming with a large number of people. Malaga disposes of a well developed bus network, operated by the EMT (Empresa Malagueña de Transportes), connecting all the urban quarters via Alameda Principal (main street between the city centre and the port). There are also interurban buses, departing from the central bus station next to the train station and connecting Malaga with towns like Nerja, Granada, Antequera, Marbella, Gibraltar and many others. The recently remodelled train station "Maria Zambrano" is an important traffic junction and a modern leisure centre. 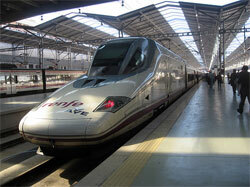 High speed trains (AVE) connect Malaga with other big Spanish cities like Madrid, Barcelona, Cordoba and Seville. Additionally there are local train connections ("Cercanías" provided by Renfe) to destinations along the Costa del Sol, for example Malaga Airport, Torremolinos, Benalmadena and Fuengirola. The Metro of Malaga is currently still under construction, but the works are supposed to end in 2010. There will be two subway lines connecting the city centre with the campus (west) and the most densely populated zone "Carretera de Cádiz" (south). However, there are also plans to establish a third line going east to the beaches La Malagueta and El Palo. The port of Malaga is, after Barcelona, the port with the second highest number of cruise ship traffic in Spain. It maintains a regular ferry line to Melilla.